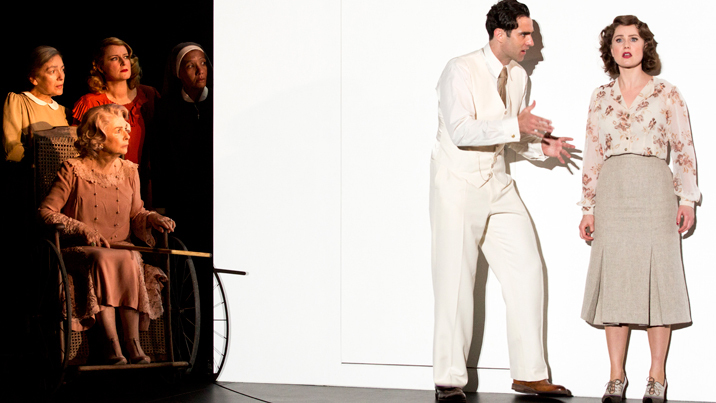 Melbourne Opera marks Verdi’s bicentenary with a celebration of their own, the completion of ten wonderful years of bringing accessible opera to Melbourne and Australia’s Eastern states. 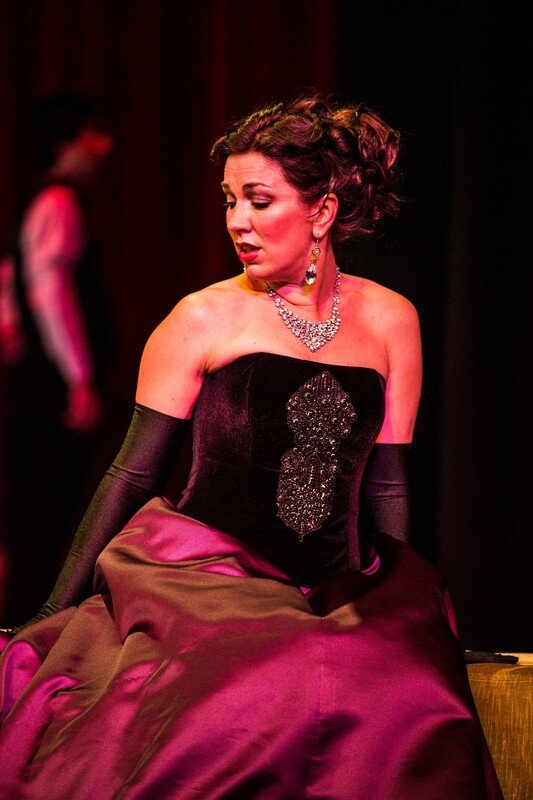 In returning to their first production, La Traviata, they welcome back cherished alumni Antoinette Halloran in her role debut as Violetta. During the haunting strains of the overture, a prologue of sorts transpires as Violetta is seen steadying her nerves as she prepares for guests. The curtain rises and Melbourne Opera is heard at its best as the full orchestra and large chorus take flight. Under the baton of maestro Greg Hocking, orchestral playing is fluid and confident, perhaps the best performance of the Melbourne Opera Orchestra heard to date. Ensemble vocals are lush and strong, with harmonies and diction clear. Kudos to Raymond Lawrence for this splendid preparation. Diction from all involved is excellent, and although the drama of the story derives benefit from the use of English lyrics, the beauty of the well-known text is distinctly muted by the translation. Singing in English has been a standing policy of the company, but, given the strides made in all areas of production, singing in the original languages with the use of surtitles is something that could definitely be considered. Newly directed by Suzanne Chaundy, this revival is clear on storytelling and emotion. Strong, interesting use is made of the ensemble during their key scenes. Andrew Bellchambers’ designs seem more sumptuous and stately than ever in this season. A maze of gilded frames suggests the chaos and glamour of Paris society, while a giant mirror symbolizes Violetta’s preening vanity. The ensemble are well dressed, including witty touches such as a couple of dames in dinner suits. Linda Britten’s gowns for Violetta and Flora are spectacular. Violetta’s act one red silk number is eye-popping and her dusky plum skirt and bodice are exquisite. Her prim outfit for the country house, however, makes her look like Eliza Doolittle in act two of My Fair Lady. Flora’s dark emerald gown is another knockout. During the overture, lighting designer Scott Allan magically illuminates elements of Violetta’s glamorous parlour so that they seem to appear from nowhere. 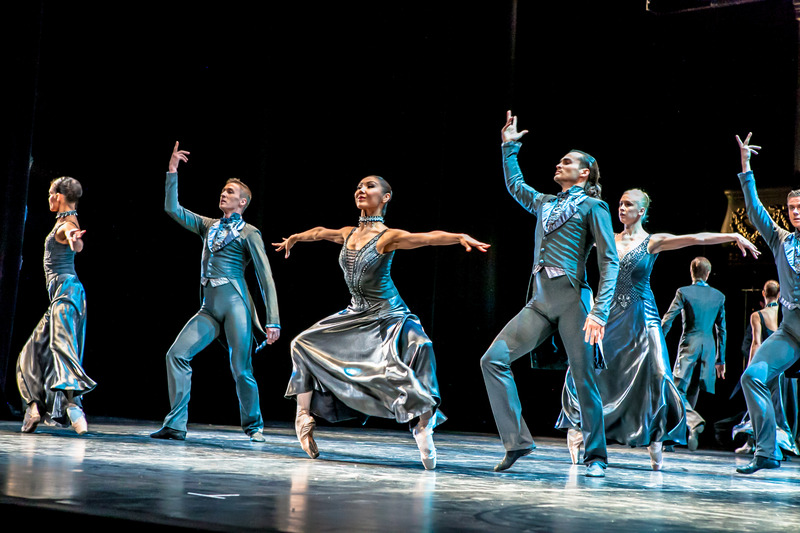 Allan pulls a similar trick to the same music in the opening of act three, shortly followed a glorious burst of sunshine as Annina opens the window. Making an auspicious debut as Violetta, Halloran shines in the leading role, her beauty and magnetism making her easily believable as the most popular woman in Paris. Halloran’s finely tuned acting skills are a supreme asset to the role, just one highlight being the terrified hesitation then instant regret at the white lie she tells Alfredo at the end of act two. 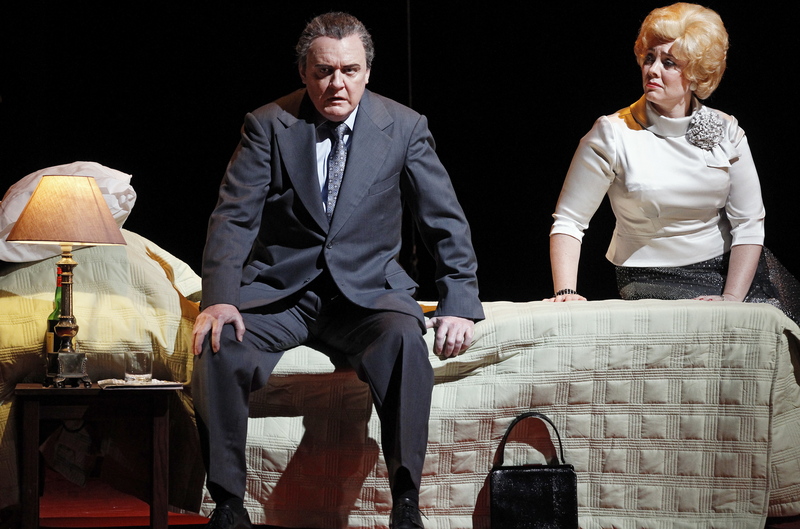 Halloran’s soprano proves well suited to the rigorous demands involved. Beginning with a lustrous sheen, Halloran moves on to reveal a pensive, considered tone. She ably conveys Violetta’s passion and desperation in act two, and her exalted prayer of act three nimbly juggles delicate fragility with steely resolve and utter despair. If there is an area of difficulty, it is in the vocal trills and ornamentals of “Sempre Libera,” but there is little doubt that Halloran will come to make these her own in subsequent performances. Roy Best is in reliably fine voice as Alfredo but is somewhat outclassed in the acting stakes by his costars. Halloran pours all sorts of passion into the relationship, but Best’s stiff manner dampens their chemistry, undermining the central love story. Manfred Pohlenz maintains an imposing presence as Giorgio Germont, focusing his characterisation on the difficulty of Germont’s impossible request that Violetta relinquish his son, Alfredo. Pohlenz’s magnificent baritone is used to great effect. He is an excellent scene partner for Halloran, their act two scene providing some of the evening’s finest and most affecting singing. 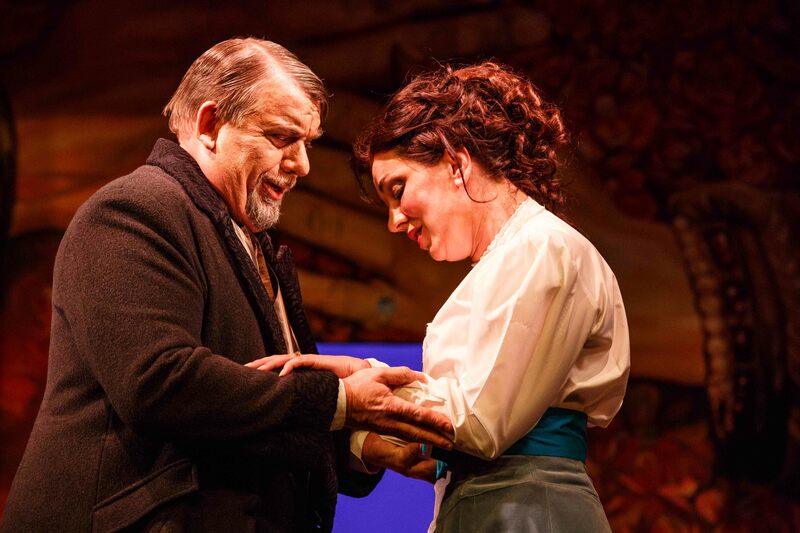 Talented mezzo-soprano Caroline Vercoe is a sympathetic, highly engaging Flora. Ian Cousins bring a dignified presence to Baron Douphol. Capable tenor Jacob Caine provides invaluable support as Gaston. 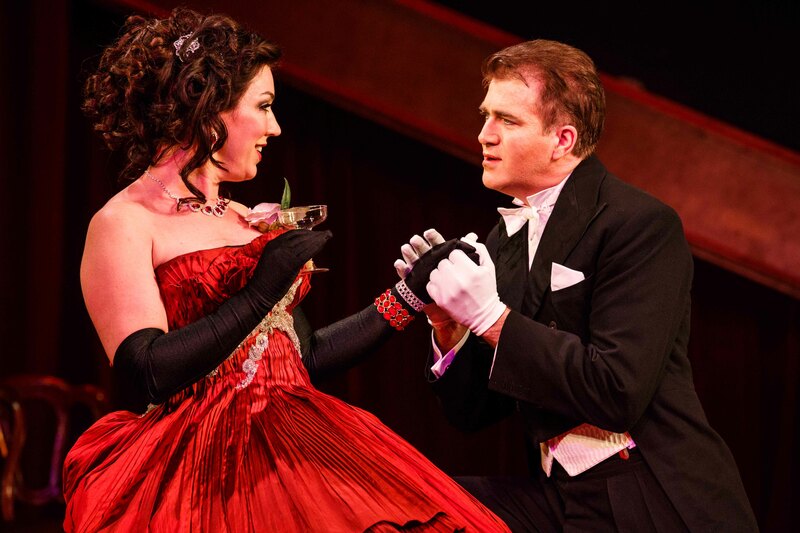 La Traviata is ideal for newcomers and is also sure to be enjoyed by lovers of the piece. This is another tremendous success from the hard working, dedicated team at Melbourne Opera. 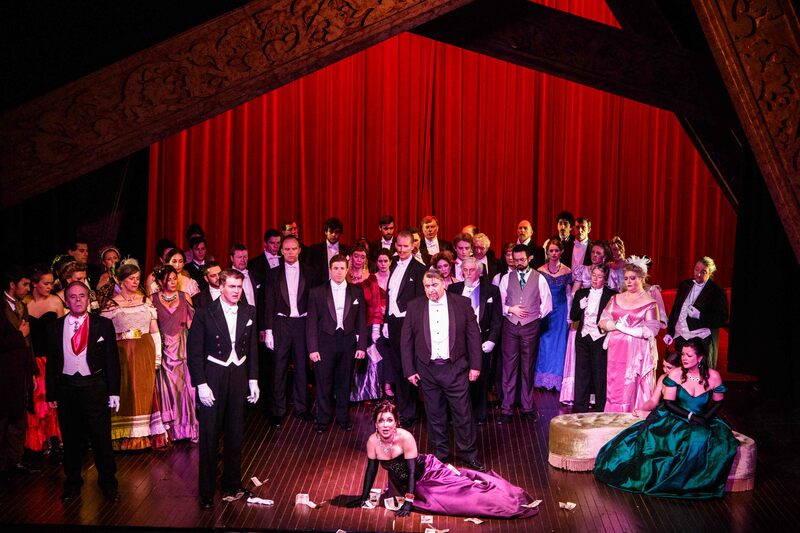 La Traviata plays selected dates at Athenaeum Theatre, Melbourne until 22 September 2013, with a special performance at Alexander Theatre, Monash University on 11 October 2013.